It's been so wonderful to hear from all of you and there were so many wonderful ideas and suggestions, I got hungry just reading your comments. There were lots and lots of different cheesecakes, red velvet cakes, pies, cobblers, a few others that I've never heard of before (Pretzel Jello?) and lots and lots of strawberries and apples. Lindsey, your mom's orange crunch cake sounds fabulous! I also learned that the berries I used to climb trees for as a child, the ones that stained all my dresses and got me into so much trouble, those sweet childhood memory berries, do have an American counterpart: huckleberries! Thank you ikkinlala, I'll be keeping an eye out for them this summer. Bev, I'll be sending you an email to get your mailing info and for the rest of you, thank you for participating. I appreciate all of you stopping by and sharing your favorites with me. It has been fun and I do hope that you guys come by and visit me again some time. As a consolation prize, I give you my latest recipe find. As I've been trying to figure out the direction of this little blog, I've been doing a lot of research. I've been going through all my favorite blogs, trying to figure out what it is that keeps me coming back and I found myself thinking that I was out of my league. But then, I thought, no one starts out fabulous, right? So I picked a few of my favorites and I started going through their first posts, hoping I'd learn from their experiences. Right now, I'm looking through Orangette's blog. I loved her book A Homemade Life: Stories and Recipes from My Kitchen Table , which I purchased a few months ago and her blog has been much of the same. She talks as if to old friends and really draws you in with her stories. And what's more, she offers countless simple and delicious recipes that are so simple and straight forward that I find myself thinking of my pantry and wondering why I haven't tried making this stuff yet. That's just how I felt when I read her post about this soup. I didn't have everything, but I did have enough to give it a go anyways, and it came out awesome! 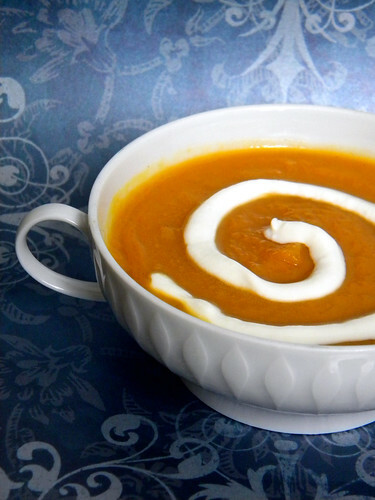 This soup is easy, healthy, yummy, comforting, filling and you should go make some right now. - Heat oil in a large stockpot over medium-low heat. Add the squash, apples, and onion, and stir to coat with oil. - Sauté uncovered, stirring occasionally, for ten to fifteen minutes, or until onion is transparent. - Stir in the mace, chili, cayenne, and cardamom, and continue cooking until the onion begins to brown. - Add the cider. Bring the mixture to a boil over medium-high heat, and cook for three minutes. Add the stock, lower the heat to medium-low, and simmer the mixture, partially covered, for another 35 minutes, or until squash is tender. - If you have an immersion blender you can just use that to puree everything in the pot. If not, you can blend the mixture in a food processor or blender until smooth, working in batches being careful to not overfill, as hot liquid could expand when machine is switched on, making a huge, burning-hot mess. Return soup to the stockpot and reduce the soup, mostly uncovered, stirring over medium-low heat until the consistency looks right to you or until you're tired of ducking from the tiny specks of boiling hot soup that will bubble up and fly all over. Stir in salt and pepper, and serve hot with or without a small dollop of sour cream. This looks great. 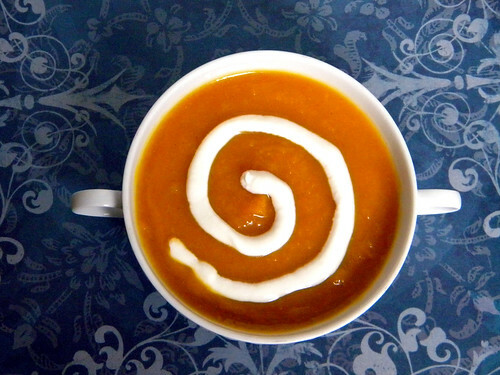 I have a butternut squash and apple soup recipe too, but I really like the combination of flavors in this one. I made it with tandoori seasoning and it's very yummy!